Over the years, UK Sailmakers' service departments have caught many problems with the condition of sails that, when addressed early enough, saved the sails from developing catastrophic damage and costing the owner expensive repair or replacement costs. When we uncover problems, we not only save the customer money, but we save sailors from losing valuable time on the water. More than once, for example, we have found that a roller furling genoa was being rolled in the wrong direction (with the UV cover on the inside of the roll) leaving the sail exposed to the destructive UV rays of the sun. By alerting the owners, we saved their pocketbooks and made them happier, more satisfied customers. Arrows point out sun-bleaching on the leech. A close-up view of sun-bleaching..
UV damage can also happen on a mainsail. 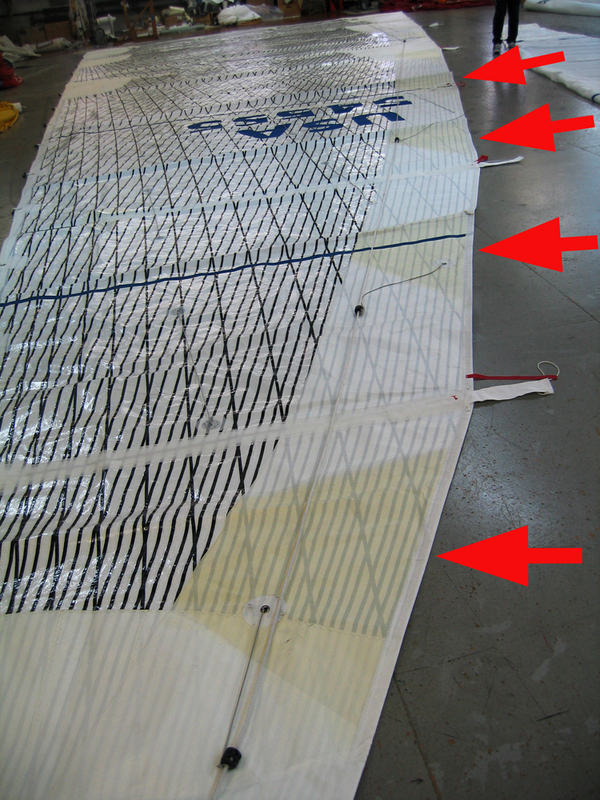 In the case of the mainsail seen in these two photos, the UK Sailmakers service department discovered UV staining or sun-bleaching on the partial taffeta layer on the leech. This sail has a Dutchman sail flaking system that puts the folds same place every time the sail is lowered, which means the same parts of the leech are always on top when the sail sits on the boom. The owner said the sail was never left uncovered. If it sail was always covered, that means his sail cover had worn out and no longer blocked the sun's harmful UV rays. Even though a cover is in one piece, the material does eventually get broken down to the point that the sun’s UV rays come through. Typically, this happens after 8-10 years depending on how close to the equator the boat lives. 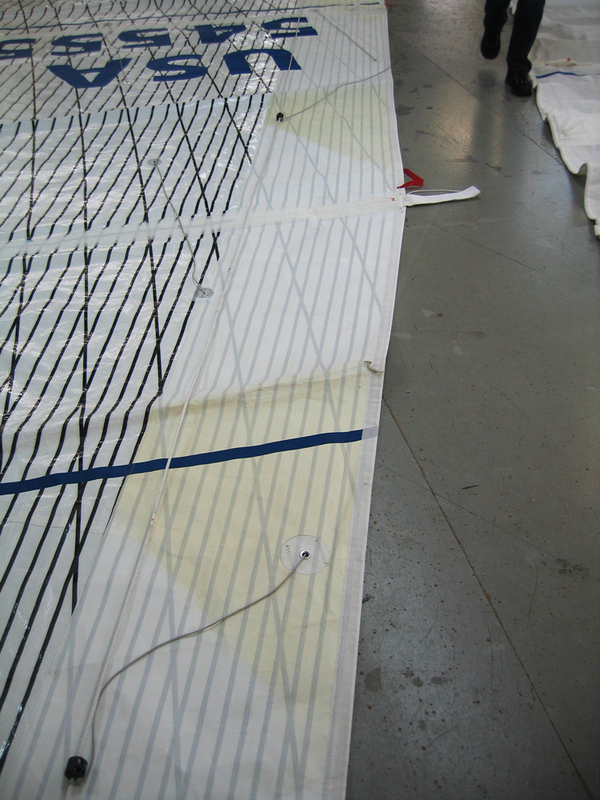 In this case, we made a new sail cover to protect this owners premium Spectra/Carbon Tape-Drive mainsail. A new sail cover is inexpensive insurance when compared to the cost of new mainsail. Remember, mainsails spend most of their time under the cover while the boat tied to the dock or on a mooring. The sun beats down on the boat month after month. A well-fitted sail cover in good condition is key to a mainsail’s durability. To fit well, the cover must be big enough to cover the whole sail and loose enough that the sail does not have to be squeezed in. All covers start with custom measurements. If your boat has lazy jacks or a Dutchman sail flaking system, the cover will need carefully placed slits and zippers to get around their control lines. If you get a Lazy Cradle, even more measurements have to be taken. Ask your UK Sailmaker to look at your sail covers and see if they need replacement. A UK Sailmakers Lazy Cradle. Newer PostBRIAN KACZOR'S TARTAN 10 "ERICA"